Should we have a head table instead? These are the questions that may be running through your head when you are asked where you plan to sit at your reception. We are here to help and offer some new and improved ideas! If you’d prefer to skip straight to consulting the professionals, simply send a request for info and we will get back to you quickly. Making the decision on where to sit calls for personal preference, but can often be determined by the chosen venue, as some set ups will work and others will not. There is no right way when it comes to where you choose to sit at your reception, but here are some things to consider. 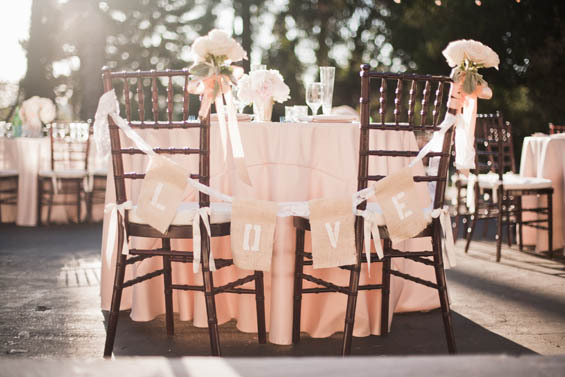 A Sweetheart table allows for the couple to have a somewhat private table seated facing their guests. A Head Table allows for the whole bridal party to be seated at the front table facing the guests. The Newlyweds are typically seated in the middle. It is all too common to hear about couples who barely have a minute to spare with just each other. This option also lets members of the bridal party sit with their families or significant other. This is a great option if being the center of attention isn’t really your style. Newlyweds who have done a head table often say it was enabled them to actually be able to eat. Another deciding factor to keep in mind are your photos. Do you want to have some of just you two sitting and talking, etc? or would you prefer photos of your larger party? Designing your Sweetheart Table or Head Table can be fun and as simple or extravagant as you would like, and we would love to be a part of the decor decision! Here at RC, we have seen both sides of the spectrum. This size table is intimate enough that it won’t feel too large for the Newlyweds and it still allows for decor or a centerpiece. You can duplicate this look with our Ivory or pearl linen, Light wood folding chairs, vases and votive candle holders. If you like this look, our silver beaded chargers, chateau flatware, regina glassware, and our mirror centerpiece will do the trick! Basically a perfect table for two! And more room for decorations! To create a similar look, use our white linen, ballroom chairs, black chair covers, pink sashes, champagne flutes, water goblets, votives and cube vases. Spice it up with a splash of color by adding a table runner! This setup can be duplicated using two cabaret tables, black linens, organza chair ties, 4ft banquet table, specialty white pintuck linen, ballroom chairs, chair covers and sashes. These ghost chairs will be a new addition to our inventory this year! Look for them come April 2014! If you prefer the ‘Head Table’ route we have options for you as well! While some may wonder if head tables are too “traditional”, we have found that there are modern twists on the old fashioned technique. So if that is your worry, check out these renditions! The stretched out look that can come along with a standard head table, is often what turns people off of the idea, especially if they have a large bridal party. We love our Napa line for this look, but it can be created with standard banquet tables too. Here are some pictures of a past wedding that used a head table with members of the bridal party sitting on both sides of the table. This new trend is also known as a “King’s table”. This modern twist is less intimidating than having the bridal party seat solely on one side of the table facing the guests. This can even be done using two standard banquet tables to create a larger space like the setup seen below. Lastly, you have the option of creating a sweetheart-head table hybrid. Square tables allow the Newlyweds to have a larger table that can include both parents, or siblings, etc if you would like! This has all the benefits of a sweetheart table, but let’s you share the intimate moments with a select few who might not have been able to spend as much time with you otherwise. This look, uses our 5ft square with a floor length black linen, champagne iridescent crush runners, pearl napkins, gold chargers, classic bead flatware, regina glassware, and our black chiavari chairs. We also have our 4’ x 4’ Napa table that can create a unique tablescape. This was a look created for a bridal expo that used silver chiavari chairs with silver organza chair ties, pink napkins and runner, royal white dinnerware and our glass cylinders as a centerpiece. Whichever direction you and your significant other decide to go with your reception seating, you will have a wonderful time planning your decor and an even better time enjoying it with those closest to you! We are here to help, so stop in to our showroom or schedule a mock table set up with one of our fabulous sales associates!